A Few More Brain Teasers! 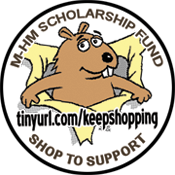 Shop to Support the Mid-Hudson Mensa Scholarship Fund! Mid-Hudson Mensa participates in Amazon's advertising referral program. Shopping through the links on this page earns advertising fees for our Scholarship Fund — at no additional cost to you! Note: American Mensa, Ltd., does not endorse these products or services. Amazon does not share with us who you are or what you bought. Tip: You can share this page by passing along this easy-to-remember URL: http://tinyurl.com/MMMOORE. Remind people that they must commence shopping from this page for the Scholarship Fund to collect fees. I’m an avid podcast listener. When reciting a fascinating factoid to a fellow member, I often start by saying: “I heard this on a recent podcast …”. For me, this media is the prefect way for a busy Mensan to keep up with the world of ideas. Yet, I haven’t encountered any local member that shares the podcast “bug”. Last year’s “20 Questions” survey found a large fraction of the group was pressed for time, but maintained a wide variety of interests. If this is you, read on. Mensa member Brian Kilby (Charlotte/Blue Ridge Mensa) was one of the earliest podcasters. It all started because Brian was a fan of the “Transformer” series of transfigurable toy robots. In 1999, he conceived the idea of recording a Transformers audio show for distribution on the Internet. He described the project as a “new, more rich, forum for Transfans”. The word “Podcast” hadn’t been coined yet, so he offered a description of this nascent technology that can be summarized as: an online radio show, in MP3 format, that would be downloaded from the Internet on a periodic basis. That’s still a good definition for what a podcast is. He reflected back then “if anyone would actually listen” to the show. Brian forged ahead, a podcast was born, and it is one of the oldest podcasts still produced today. A few years after Brian’s initiative, Apple’s wildly popular iPod portable player was introduced. In the mid-2000s it was an important player (pardon my pun) in the exponential growth of podcasting. The demand for free audio content to fill these iPods (and like devices), development of software to automate downloading podcasts, and the buzz created by the newly invented word, “podcast” (a combination of “iPod” and “broadcast”) brought this media into the mainstream. Apple though, was not flattered by the use of “pod” affixed to software that was cropping up at the time. This forced some popular, pioneering titles to undergo a sudden name change to avoid legal problems. The word “podcast” stuck and even Apple embraced it. Podcasts are now available for any topic you can think of and can last a few minutes to hours. Finding them is easy: use an Internet search engine (Google, Yahoo!, Bing, etc.) to enter a topic of interest, followed by the word “podcast” (try “history podcast” or “book club podcast”). Many radio shows archive episodes as podcasts (search on: “NPR Podcast”), allowing you to time-shift your listening. A query for “Mensa podcast” finds Mensa Education & Research Foundation’s “Conversations with Mensa” series. Many episodes are Colloquium topics. Often, sites include the option of downloading the audio file or listening directly from the page. As an established medium, your software should be able to handle either way without any configuration. If you stumble upon podcasts you’d like to listen to, as new episodes become available, search for “podcast aggregator” software to automate the downloading process. If you have Apple’s iTunes software, you’re all set: just type “podcast” in the search bar for a huge listing of podcasts – all free. Listen in iTunes by clicking the episode name or click the podcast series name to open a page with a “subscribe” button. Subscribing will download new episodes to your iTunes Library as they are made available. If this short article has stirred your curiosity, I’ve created an online listing of the sites mentioned here: [below]. Happy podcast listening! After driving 14-hrs Sunday, from the Hudson Valley of NY to a hotel outside of Knoxville, I awoke at 3 a.m. Monday morning for the final 90-min journey to my observing site. At 6 a.m. I arrived in Tellico Plains, Tennessee — population 941 — a farming community in the foothills of the Smoky Mountains that abutted the Cherokee National Forest. 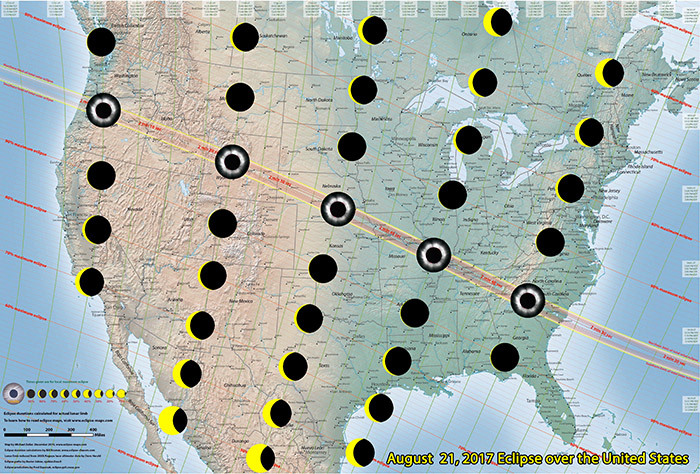 It was also near the center-line of the eclipse and the location expected about 2’ 37” of totality. I could make out heavy clouds in the pre-dawn sky that gave me some pause on what to expect that day. A local church had promised a free pancake and sausage breakfast at 7 a.m. True to their word a small line had formed outside a food truck and I enjoyed my share of what they called "solar stack" pancakes. I was relieved to see the morning clouds burn off as the Sun rose for a mostly sunny day. Right after 1 p.m. 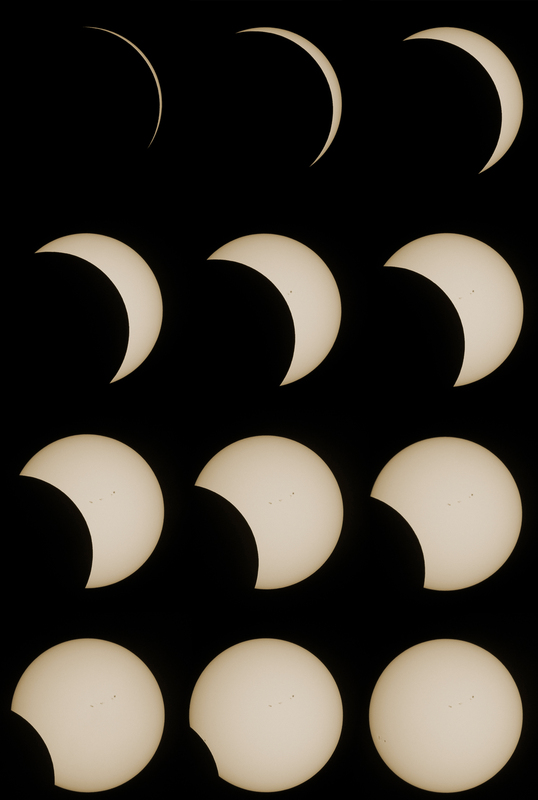 I began a series of timed exposures of the partial phases of the event when the Moon begins to cover the Sun. 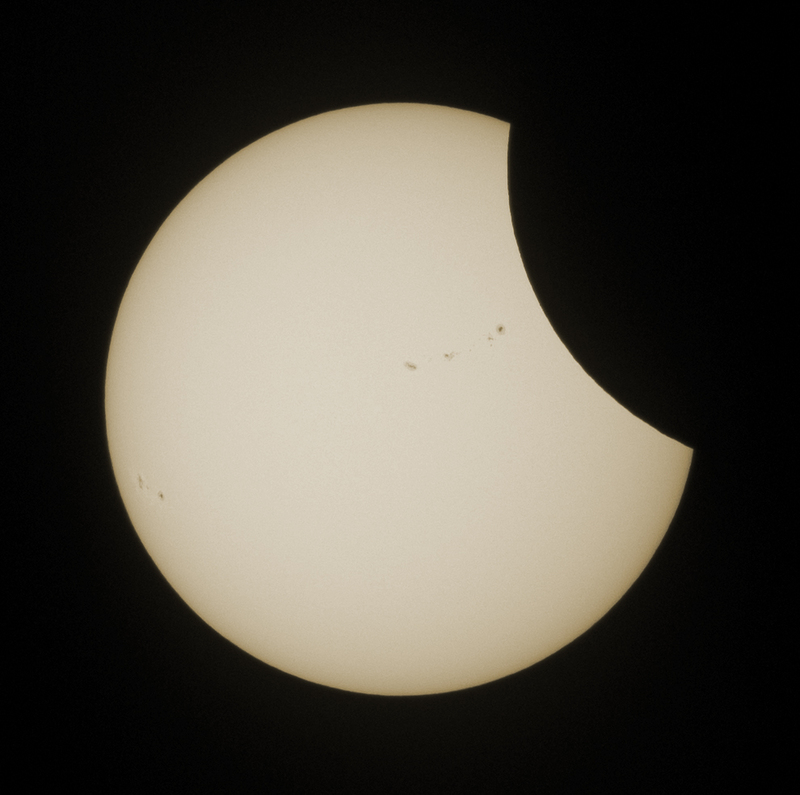 This series of images extended from before the start of the eclipse to a bit after sunspot 2671 was covered about 40-minutes later. In the final partial phases, before totality, the light turned sunset-yellow and the breeze died. While the quality of the light had a familiar twilight-feel, it came from high in the sky and without any accompanying long-shadows. The other-worldly lighting added to the anticipation of the event. In the final seconds before totality, the sky dimmed rapidly and the crowd started screaming as we were engulfed in a deep twilight. One of the alarms on my smartphone went off to remind me to remove the solar filter from the telescope. Totality is imaged without this filter. 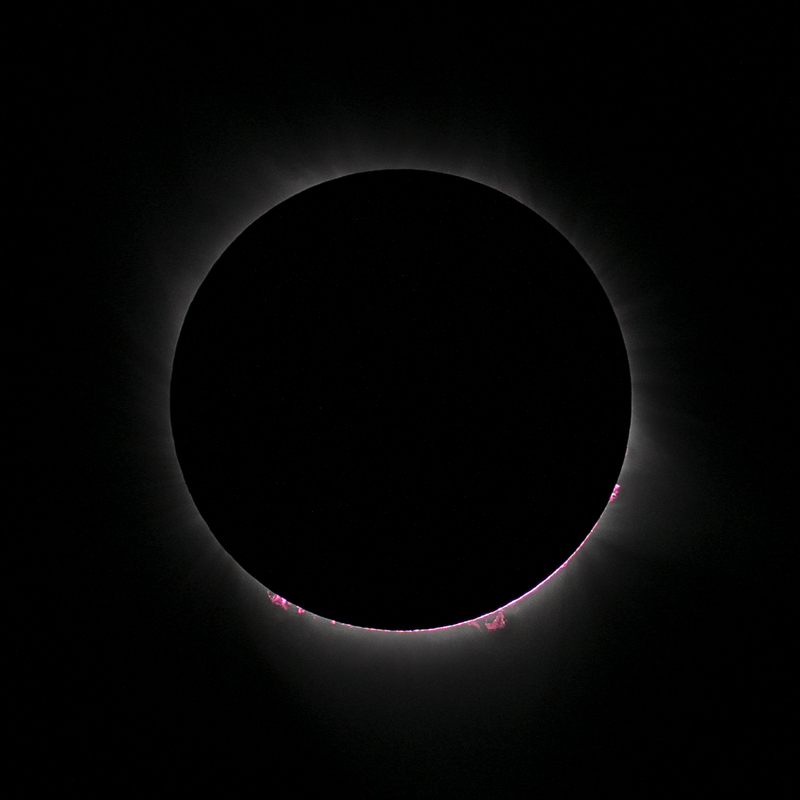 I did so and then clicked down and held the shutter button icon of the software on my laptop to take the first set of bracket images of totality. While the digital camera made its artificial shutter sound and the laptop screen told me that the images were downloading, I looked up at the spectacle the crowd was continuing to “oooh” and “ahhh” about. 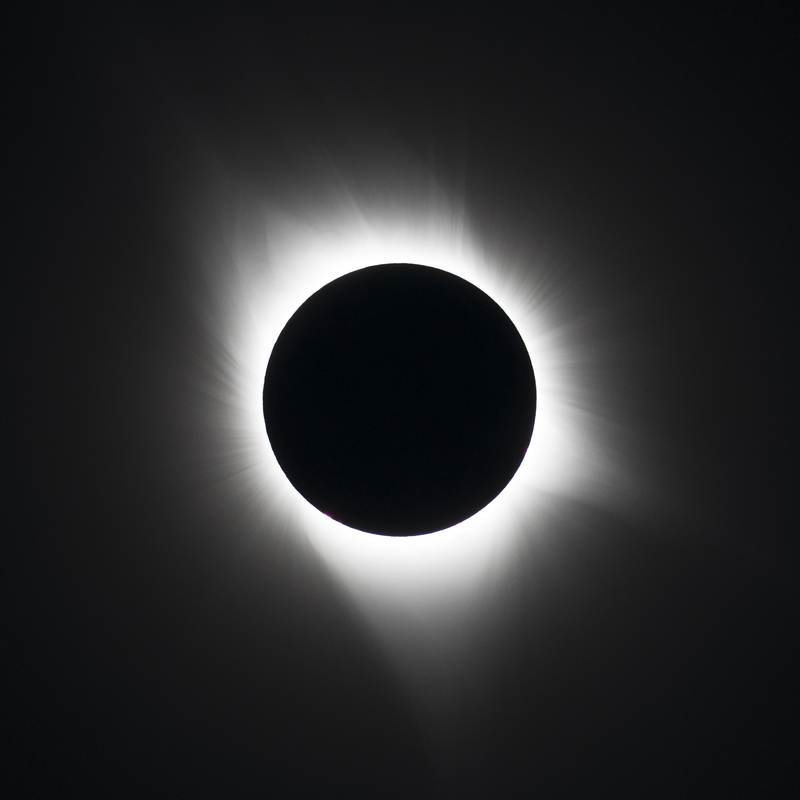 My impression of the eclipse was a black hole in the sky surrounded by diaphanous material through which shown a blinding white light (the solar Corona) that turned the sky blue in its immediate vicinity. Away from the Corona all was nearly black and the Venus shown in the west. With another alarm chiming on my smartphone, I put the solar filter back in place — the 2’ 37” of totality were over much too soon. The glaring white Corona, the Sun's atmosphere, extends a great distance beyond the edge of the Moon. No single image captures totality as you really see it. After 3rd contact the Sun began to emerge from behind the Moon. 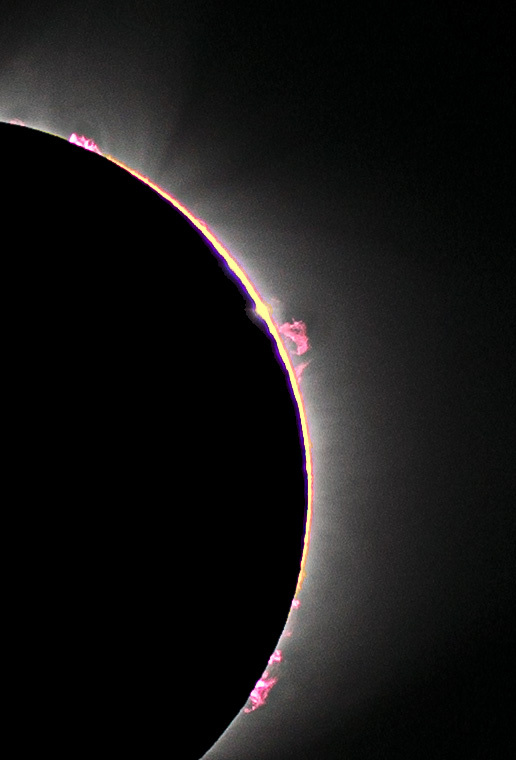 Red prominences are visible on the solar limb. Without the eclipse, you'd need an expensive Hydrogen-alpha scope to see this. Same as above but cropped with the blue channel dropped on the solar limb to let yellow come through to create a striking image. Same as above but 9-seconds later. 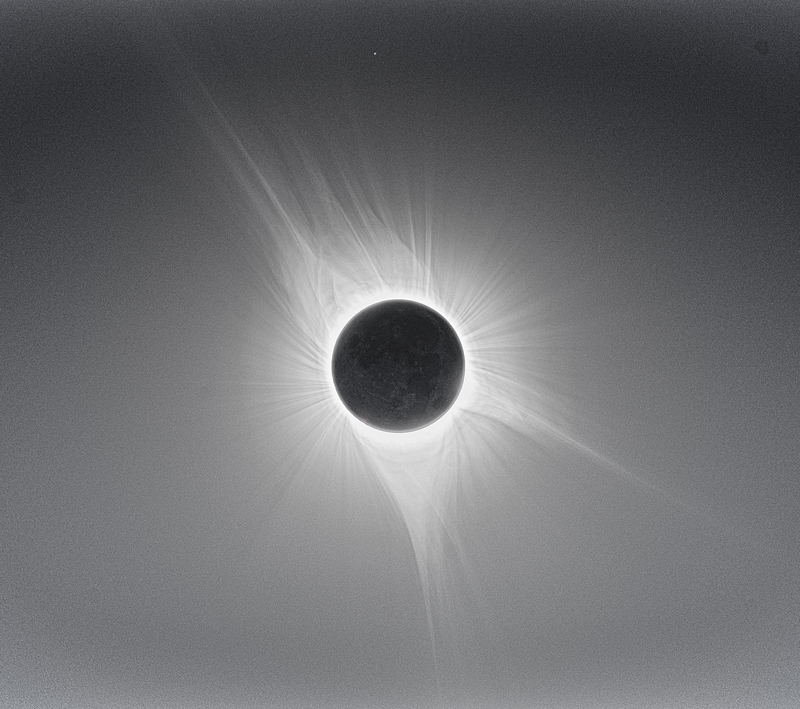 All my totality exposures combined and manipulated to show extent of the Corona. You can also see the face of the Moon from reflected earthshine. Moon approaching sunspot 2671 — this is the sunspot I focused my scope on prior to imaging. Every 8-minutes from the end of totality to the 4th contact — the end of the eclipse. A short video I made for my company (most of the gear I took down I borrowed from them) featuring the images I took. The first with a path of totality crossing the USA's Pacific coast and Atlantic coast since 1918. The first where totality makes landfall exclusively within the United States since 1257 (over 500-years before there even was a USA). The longest totality was 2 minutes 41.6 seconds at Shawnee National Forest, in Illinois and the greatest extent (where the Sun-Moon-Earth line up exactly) was between Hopkinsville, Kentucky and Princeton, Kentucky. 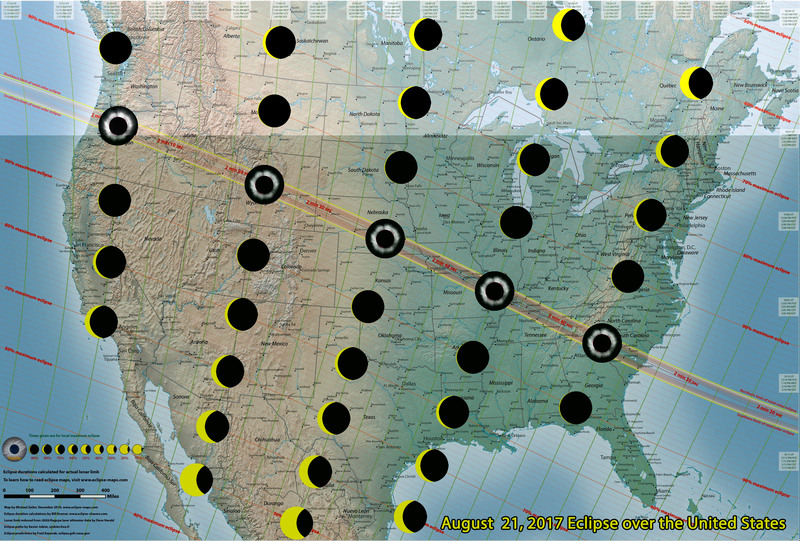 If you missed this one, you'll have another chance on April 8, 2024 to see the next Great American Solar Eclipse from Texas to Maine. History has a habit of getting lost. Do you remember when Friends debuted on TV? Our puzzle this month is all about dates. Your mission is to match the date with its historical or hysterical event. I am driving home Wednesday night with a New York State lottery ticket in my pocket, thinking about how my life will change when I win $10 million. Most of us lottery players think about this topic, from time to time, especially in the moments before the winning numbers bounce into view from the wonderful, plastic bingo ball dispenser on TV. We think about paying off our bills, buying jewelry (the outrageously expensive, gaudy kind), cars (ditto), and houses... many of them. We dream of taking trips -- always first class -- to exotic places. The more altruistic of us, of course, contemplate paying for our children's education or our parents' long term health care. For the especially generous among us, supporting one or more philanthropic causes is definitely on the list. This evening, however, I think not about what I would do with an appreciable portion of a multi-million dollar jackpot, but what I wouldn't. From the grandiose to the trivial, I realize that my life is filled with things that can be eliminated by the possibility of independent wealth. Here are the things I intend to give up. 1. I would no longer peel or steam off uncancelled postage stamps. 2. When dining out, I would no longer agonize over the relative value of one appetizer over another on a dollars per ounce basis. 3. I would no longer deduct the tax from my restaurant bill before I calculate the tip. 4. I would no longer begrudge the hat check woman her tip. 5. I would no longer park my car five blocks away from a restaurant or hotel to avoid valet parking. 6. I would no longer walk across the street merely to avoid the street musician with his open guitar case obstructing the sidewalk. 7. I would no longer belong to any organization that required my presence at 8:00 o'clock or (shudder) earlier in the morning... ANY morning. 8. I would no longer compare supermarket prices of tuna fish. Or cereal. 9. I would no longer purchase supermarket flowers. 10. I would no longer wait for my favorite brand of soda to go on sale, or settle for a generic brand. 11. I would no longer buy the economy size of anything that tends to get soggy, go flat, or smell yucky towards the end of its life. 12. With respect to opened milk containers, I would no longer resolve doubt in favor of freshness. 13. I would no longer scrape the sides of peanut butter jars. 14. I would no longer precariously drain ketchup from one bottle to another. 15. I would no longer scoop melons down to the rind. 16. I would no longer drink tap water. 17. I would no longer eat leftovers. Come to think of it, I would no longer place leftovers in my refrigerator. In fact, I would no longer have use for Saranwrap or Reynolds aluminum foil. 18. I would no longer put up with dull knives, dull scissors, or dull people at cocktail parties. 19. I would no longer borrow my neighbor's snow blower. In fact, I would no longer personally remove snow from my driveway, or anyone else's. Or even my walkway. 20. I would no longer buy seats in the bleachers. 21. I would no longer be tempted to purchase a monstrously large popcorn and drink at the movies merely because it's the best value. 22. I would never again see the inside of a store whose last four letters were "MART". 23. I would no longer buy my clothing out of season. 24. I would no longer wear jeans with holes in them (unless fashion designers made it clear that they looked the coolest that way). 25. I would no longer check my watch before I began a long distance call and every minute thereafter. For that matter, I would no longer even wear a watch. 26. I would no longer fill up with the lowest grade of gasoline. And I would never again pump gas myself. 27. I would no longer keep toll receipts. 28. I would no longer keep a list of books to watch for ___ a year after publication ___ when they are scheduled to come out in paperback. 29. I would no longer reuse mouse traps. 30. Finally, I would no longer open any envelope on which Ed McMahon's face appeared. If you want to see a shorter winter, borrow money that's due in the spring. Some people drink from the fountain of knowledge. Others just gargle. Time after A. M. and before P. M.
Electronic device for detecting storms, speeders, and enemy aircraft. A device for finding a horizontal line. An Eskimo (or Inuit if you want to be up-to-date and politically correct) boat. Inhabitant of a particular Pacific island rich in phosphates. Sergeant Snorkel's dog in the Beetle Bailey comic strip. Familiar nickname for button-down comedian Newhart or Flame calendar editor Haley. District and village in northwestern Scotland, near Isle of Skye. Having the tartar removed, as from wine. British affectionate term for mother and also a short form of the name of a showy perennial flower. A small apron for a baby or someone dining on lobster. A joke or prank or to prevent from speaking. January 1st is traditionally the one day that many people come up with one or two or a whole list of things they would either like to do or stop doing. My New Year's list is quite simple; "Wait until a better time of the year to start on my s." What joy can I find from trying to change my life when I can't both drive to and from work in daylight? How does trying to change bad habits or cultivate good ones help when coping with snow and cold? It is all I can do to survive what is happening with the weather, without heaping additional self-imposed stresses. If New Year's Day is not a candidate for forming positive s, what day would be a good one? One candidate might be either of the equinox. Spring is a season when the world around me is wakening and greening. This is a time for new beginnings, and it is a time that -- if I am trying to destroy an old habit -- there are things to do other than to be housebound by the cold and the dark. The autumn equinox is a time when we should realize that like the balance of sun and dark and swinging to the darkness, that our lives are dwindling to closer to an end, and we should become as humane and good as possible. If not an equinox, Memorial Day is one that should see us reflecting on the sacrifices that soldiers have made in the name of our freedoms. How more appropriate to try to change ourselves for the better as a remembrance that we have the freedom to change. Instead of Memorial Day becoming a day off from work, it could be the day we decide to reflect and to make promises to ourselves to keep. If not Memorial Day, the Fourth of July is another good choice. As our country declared its independence and decided to fight for the right to self-govern, so can it be a day when we acknowledge our desire for independence from bad habits or the right to cultivate positive traits. The list of potential days could go on for as many days as are in a year. And maybe that is the answer. Maybe every day should be one where we reflect what we can do to become better individuals, to make a positive difference in someone's life, to make the world a better place. It makes no difference if for some reason we break one of the day's s, as long as the next day we start again. It's the trying that counts. 1. A man gave one son 10 cents and another son was given 15 cents. What time is it? 2. If I were in Hawaii and dropped a bowling ball in a bucket of water which is 45 degrees F, and dropped another ball of the same weight, mass, and size in a bucket at 30 degrees F, at the same time, which ball would hit the bottom of the bucket first? 3. Ruth is 20 years old in 1980, but only 15 years old in 1985. How is this possible? 1. 1:45. The man gave away 25 cents divided between two people. Therefore, he gave a quarter to two. 2. The ball in the bucket of 45 degree F water hits bottom last. Did you think that the water in the 30 degree F bucket is frozen? Think again. The question said nothing about that bucket having anything in it. There is no water (or ice) to slow the ball down. 3. The years are in B.C., not A.D.